Companies included in the latest EMEA Deloitte Technology Fast 500TM achieved revenue growth ranging from 220 percent to 107,117 percent, with an average growth of 1,377 percent. The vast majority of those businesses have expanded into new global territories, and quick. With the most recent IMF World Growth Forecast predicting emerging markets and developing economies to grow by 4.9% this year, it’s an exciting time for organisations looking to expand overseas. But, how would your current HR systems adapt to such rapid growth into the double, triple, or even quadruple digits? Many of the companies seen in the Technology Fast 500 have a shared services HR model. This ‘rationalised’ approach provides economies of scale. It consolidates processes through a global HR system rather than separate HR and payroll systems in each location. But this approach can fall short if it doesn’t take account of local nuances in a complex global arena. As the recent Deloitte 2018 Global Human Capital Trends report shows, localised social capital is more important than ever. 65 percent of CEOs rate “inclusive growth” as top-three strategic concern; the incorporation of external trends and perspectives beyond just those of customers and employees. If your business is looking to expand into another country, you will need to show that it is symbiotic with local communities and regulators. Most of us will recall Ryanair being fined £7.5m for falling foul of the French authorities for breaching labour laws in Marseille back in 2013. How confident are you that the model clauses you have in place allow the flow of data across the different legal entities and jurisdictions? Nations are constantly transforming their labour laws to tackle unemployment and make their country more competitive in the global market. Only a year ago, France overhauled its complex labour laws to give employers a lot more flexibility over the hiring and dismissal of employees. And France is not alone. On 7 August this year, Italian parliament passed legislation to tackle short-term work and precarious labour practices. To operate in what Oracle coins a ‘glocal fashion’, the use of people data is a vital component. By this I mean a configurable workflow that keeps track of where employees are and what type of work they are doing. From an HR technology viewpoint, the aim is to leverage people data from a combination of sources to determine an employee’s work commitments and to identify any tax or immigration considerations. The argument for introducing a global HR system that draws on people data, is strong. New global research from the CIPD and Workday illustrates an important relationship between the use of people data and strong business outcomes. If we look to South-East Asia and the Middle East and North Africa (MENA), over 60% of HR respondents to the CIPD survey said they have a standardised approach to using people data compared to just 42% of UK respondents. And if we look at the use of artificial intelligence to compile data reports, almost half of South-East Asia HR professionals are already applying it. So how do you choose one global HR system that is able to grow with your business and able to take account of local preferences? You’ll need to decide whether to invest in a scalable HR system up-front or plan for eventual transition to a tier 1 system. Firstly, consider the ability of a system to adapt as the organisation grows in size; whether that’s from 50 to 200, 200 to 1,000 or more. Secondly, is it intuitive enough to enable you to expand from a UK base to include a workforce overseas? There are some brilliantly capable platforms that automate global processes and policies, while enabling regional teams to remain compliant with local laws and regulations. With Workday HR management software, for example, you can create regionally specific offers and employment agreements automatically. You can manage employee probation periods, collective agreements, notice periods and contract across multiple jurisdictions across the cloud. And Oracle’s global HR system cloud-based system takes away the complexities of managing a global workforce, by enabling you to deploy complete HR capabilities across 200 countries, jurisdictions, and industries using just one system. Our HR systems selector tool can quickly help you establish your options. Essentially, global projects bring people together. It’s no surprise then that 12% of the workforces in global businesses are internationally mobile. For many organisations, the main driver of an integrated global HR system is that it facilitates talent mobility within the company. Consider a business that is setting up a new office in Spain with a strong need for a niche team of engineers. It may have a team in another location with exactly the rights skills having just delivered a similar project. Unless your HR systems are globally aligned, the match between the business need and existing skills would be purely reliant on project managers exchanging the information between themselves. Global businesses are embracing the mobility that HR automation and artificial intelligence brings. In the past year, there has been a rise in the number of global leaders and teams who bring a more dynamic world-view to their roles. 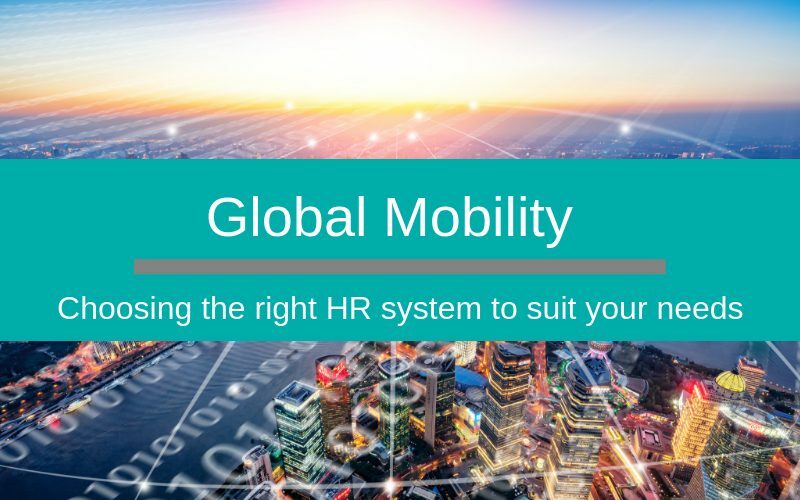 If global mobility is an aspiration, you’ll not only want your chosen HR system to meet the demands of your business but give you the flexibility to seamlessly manage immigration information, taxation data, work permits, visas and travel documents, and quick. Implementing a global system will raise questions about all kinds of processes and at the same token create opportunities to make process improvements. You’ll therefore need a Project Manager and HRIS Manager experienced at global change management. This is precisely why many HR departments enlist an experienced partner to help guide them throughout this process. Even Oracle concedes that the “relative ease at which your company can expand or contract global operations with a cloud-based HCM system” will depend on whether change management is considered concurrently. Companies that use change management are 1.6 times more likely to remain within budget; 4.4 times more likely to stay on schedule, and 6 times more likely to meet project objectives. Talking from experience, it’s advantageous to have a centralised HR system team; where its overarching goal is to obtain an ROI on any HR software. This team can manage and ensure a global standard for data management and minimise the risk of data breaches. Most importantly, they will ensure access to data is limited to only what is required for an individual job. This does require a strong project manager throughout implementation to ensure regional or local differences are carefully considered before building a system. They won’t be afraid to challenge the status quo. There’s also less risk of employees feeling less favoured over another office in a different location since all employees will have access to the same tools. Crucially, a single global HR system can integrate with other systems; multiple HR systems cannot. Whatever system you choose though, needs to be configurable by an HRIS Manager. After all, you will not want the added expense of a consultant for every change that needs to happen. With a cloud based global HR system, you’ll have one upgrade to manage; not multiple ones across all locations. For further guidance on selecting a global HR system to meet your business needs or to book a HRIS Healthcheck to see how ready your current system would be for global expansion, contact the Silver Cloud HR team today!